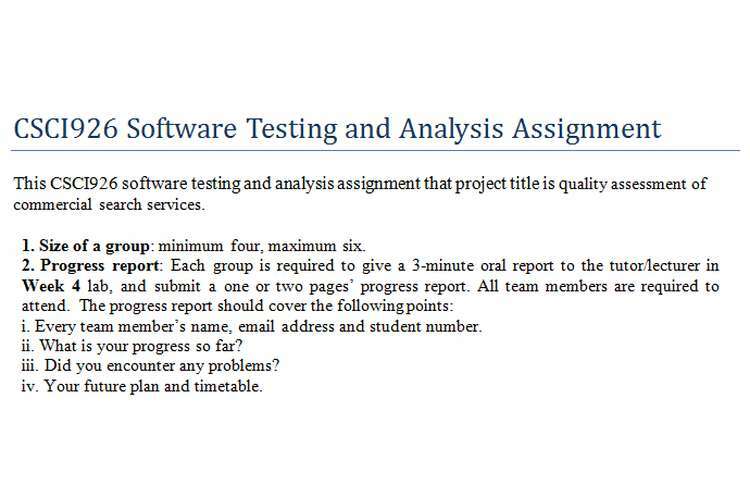 This CSCI926 software testing and analysis assignment that project title is quality assessment of commercial search services. 1. Size of a group: minimum four, maximum six. Every team member’s name, email address and student number. Your future plan and timetable. Each team member is assessed individually based on his/her individual contribution. Basically, the “individual contribution” of each team member is assessed by all the other team members in terms of “contributed”, “very little”, and “almost no contribution”. For a team member who has “contributed”, he/she will receive 100% of the group marks; for a member who contributed “very little”, he/she will receive 50% of the group marks; for students who made “almost no contribution”, he/she will receive 0 marks for the group project. Details of individual contributions for each team member must be printed on the cover page of the final project report. In some situations, the above criteria may be adjusted by your lecturer. Submit a hardcopy of your presentation slides to the lecturer/tutor immediately before your group’s presentation. It is not compulsory for all team members to speak, but all team members must stand in front of the class during their group’s presentation. If a student is absent from his/her group presentation, the student will receive 0 presentation marks. 3. Did you use a folder to enclose all submitted materials when you submit the final report in week 13 lecture? Step 1: Conduct in-depth study of the following paper (available in Moodle site under “Readings”). Also read related papers when needed. Z. Q. Zhou, S. Xiang, and T. Y. Chen, “Metamorphic testing for software quality assessment: A study of search engines,” IEEE Transactions on Software Engineering, vol. 42, no. 3, pp. 264–284, 2016. Example of comparison: realestate.com.au vs domain.com.au on a common set of software quality characteristics (e.g., reliability).